This is the time of year when people often stop to think about what they’re thankful for. Of course, priceless things like your health and family top the list. Having a working car to get around Fort Collins is definitely something to be thankful for, too. Just don’t forget about all the accessories inside your car! Aftermarket add-ons make it more enjoyable to drive around town. If you have any of the car accessories on this list, Thanksgiving is a great time to remember how grateful you are for them. And if you’re missing anything, now’s a great time to add them to your wish list. 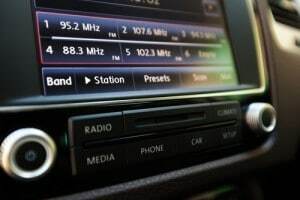 Having a Bluetooth radio in your car is incredibly convenient and useful. First, it gives you a wireless way to listen to music from your phone over the car’s speakers. It also lets you hear directions from your phone’s GPS over the car’s sound system for easy navigation. Bluetooth also lets you send and receive calls and texts without touching your phone. Voice control over a microphone included with the hands-free radio makes this possible. Hands-free conversations keep your hands on the wheel and your eyes on the road where they belong. Dash cams are hugely popular in China, Russia, Australia, and other countries. They haven’t taken off as much in the US, but if you buy one and use it regularly, you’ll quickly find out it’s worth having. You can capture footage of amazing things happening around you that occur too fast to anticipate and start recording on your phone. 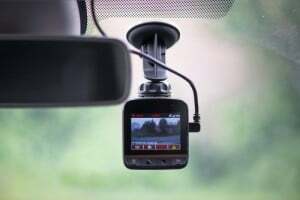 A more practical purpose for dash cams is to capture footage in case you get in an accident. This makes it easy to defend yourself in court if it’s the other driver’s word against yours. 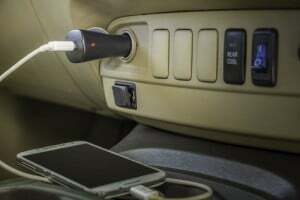 The cigarette lighter in your car is a convenient place to charge your phone – assuming you have a USB car adapter. These come in all shapes, sizes, and capabilities. The cheapest adapters have only a single USB port while others have two to four USB ports and a three-prong outlet for other electronic devices you might want to take on the road, such as a laptop or portable DVD player. Road trips will never be the same with one of these car accessories! If your car didn’t come with built-in screens, you might have some of those portable ones attached to the front passenger and driver’s seat with Velcro. 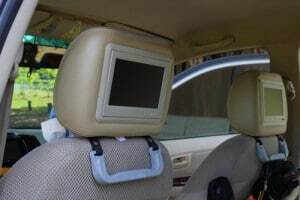 Fortunately, there’s a nicer-looking alternative to this: headrests with built-in monitors. Look for headrests that fit your car’s specific make and model, or find universal units that tidy up your car’s interior while still providing entertainment for kids in the backseat. Unless your car has a built-in NAV system, you probably turn to your phone when you need a GPS to help you get around. A dashboard or windshield phone holder keeps your phone within sight for safe, hands-free navigation. Some phone holders work by clipping to the air vent and use a magnet to hold your phone steady while you’re driving at high speeds. The magnet makes it easy to remove your phone without fumbling with suction cups or stiff holders. When it comes to saving money on road trips, nothing beats bringing your own food and drinks from home. 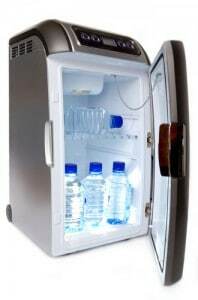 A travel cooler is a great way to keep perishable food cool. Choose one that plugs into the cigarette lighter and you’ll have cool food and drinks indefinitely. Some ingenious travel coolers can double as travel warmers with heated cup holders to keep your coffee hot on your entire commute to work. The unit replaces the center console and provides excellent functionality. Analog tire gauges work fine for measuring your tire pressure in a pinch, but digital versions are more accurate and easier to use. Plus, with the option to select readouts in several different units, you ensure you always understand what your tire pressure is. There’s no point in having fancy car accessories if your ride breaks down. Make regular vehicle tune-ups and maintenance a priority to keep your car running well so you can enjoy all your accessories to the fullest. Stop by Scott’s Fort Collins Auto & Repair for a tune-up today! You can call ahead at 970-682-4202 to let us know you’re coming or schedule an appointment online.